Introverts make up 30–50 percent of the workforce. What can you do to help them thrive? Extroverts are celebrated in our culture as movers and shakers. They are perceived as strong leaders who are actively engaged, gregarious and assertive. Introverts, on the other hand, have strengths—creativity, focus, grit, and even leadership—that are usually overlooked. Instead they are often viewed in less flattering terms: quiet, shy, or even poor collaborators. Because of this perception, many introverts go through their day trying to overcome their natural tendencies and to exhibit more extroverted types of behaviors that seem to be critical to success. It’s an exhausting way to live, and limits their ability to use their natural strengths. Business leaders, many of whom are introverts themselves, are starting to recognize that introverts are a huge and valuable portion of the workforce, and they struggle to reach their full potential because they work in a physical and cultural environment that has a bias toward extroverts. “One-third to half the population are introverts,” says Susan Cain, author of the international best seller, “Quiet: The Power of Introverts in a World That Can’t Stop Talking.” Since businesses have placed more value on extroverts, introverts have had to adopt extroverted behaviors in order to survive in corporate culture, Cain notes. Introverts can be highly creative and are more sensitive to external stimuli than extroverts, which means that an over-abundance of boisterous group work can be more exhausting. While they often need time away from colleagues in order to work effectively, quiet, private spaces are often lacking in work environments. Steelcase and Cain have teamed up to offer a range of spaces based on a deep understanding of introverts and how they work best. The new Susan Cain Quiet Spaces by Steelcase is a series of private workspaces with carefully integrated architecture, furniture, technology, surface materials, lighting and work tools designed for the unique needs of introverts. The collection is based on a combination of Steelcase research about the universal human need for privacy and Cain’s in-depth research on the needs of introverts. “Introverts recharge their batteries by being more on their own or in low-key environments, and extroverts recharge their batteries by being in spaces where there’s a lot going on,” explains Cain. “The nervous system of introverts reacts more to that kind of stimulation. So if introverts go into a space that’s too noisy or cacophonous, you’re placing extra cognitive load on their thought process that doesn’t need to be there, and shouldn’t be there if you want to get the best of everyone’s brain. 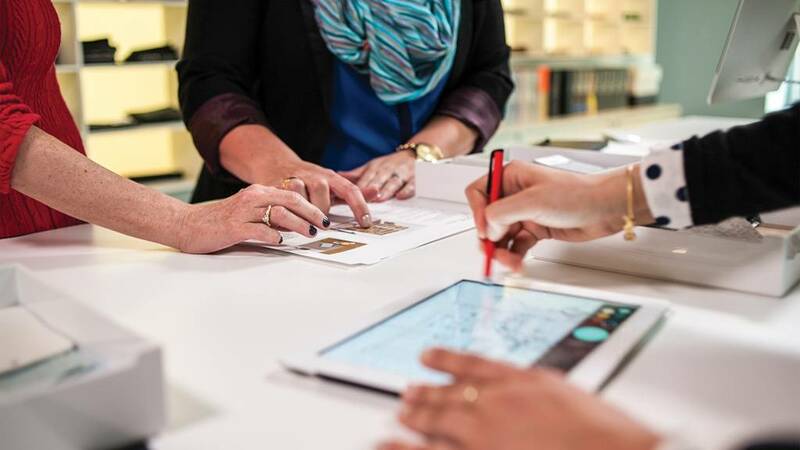 Steelcase research confirms the need for more privacy options for all workers. In the United States, 31 percent of full-time employees say they have to work away from their primary location to accomplish their tasks. The Steelcase Workplace Survey of more than 39,000 workers shows that 95 percent say they need quiet, private places in the workplace for confidential conversations, yet 41 percent don’t have them. Another Steelcase study of more than 10,000 workers in 14 countries around the world confirms that having options for greater privacy contributes to people feeling more engaged at work. In their drive for greater collaboration and innovation, many businesses build energizing open environments but sometimes neglect to include spaces that allow workers to control the amount of stimulation they receive, in terms of sound, light, and communication. At times, people want more stimulation, at other times less. Introverts need to have a range of places where they have choice and control over where and how they work. Susan Cain Quiet Spaces by Steelcase offers organizations a range of spaces that can be incorporated into their new or existing workplace and can help introverts thrive. Susan Cain and the Steelcase design team created design principles for Quiet Spaces. “I’m not a designer, but I know introverts and what works and what doesn’t. The designers got it right away,” says Cain. 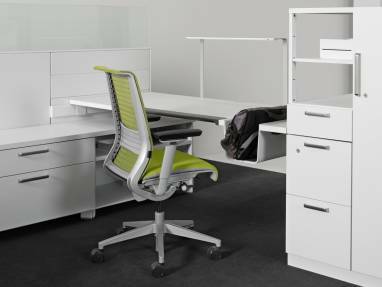 Cain collaborated with the Steelcase design team to develop a set of design principles for the Quiet Spaces. They met weekly over a period of months and fine-tuned the five final spaces. “I’m not a designer,” says Cain, “but, as a researcher, I know introverts and I can tell you what works and what doesn’t, and the Steelcase designers got it right away. Permission to be alone: the freedom to focus and innovate without interruption from an otherwise highly stimulating workplace. User control over environment: the ability to control elements of the workspace. Sensory balance: the ability to control sensory stimulation, often in the form of calming, more intimate influences. Psychological safety: having the choice of places to be unseen and unable to see others. Are you an introvert or extrovert? Susan Cain has developed a 20 question quiz to assess yourself and learn where you fall on the introvert/extrovert spectrum at thepowerofintroverts.com. 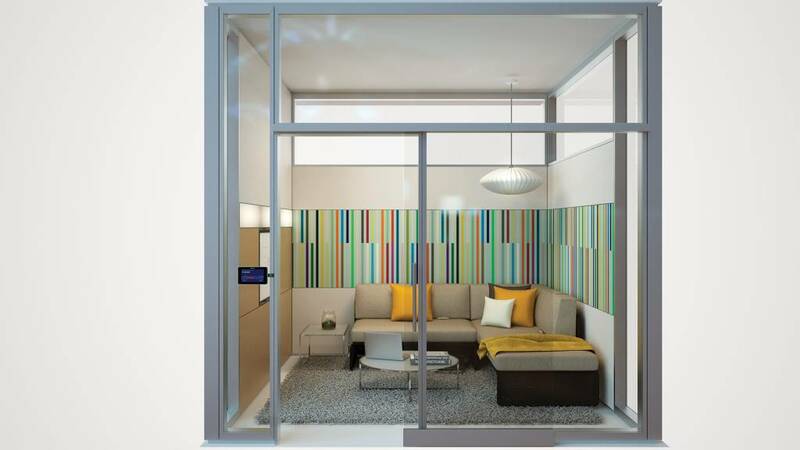 Susan Cain Quiet Spaces by Steelcase offer five diverse ways to support introverts at work. Footprints range from 48 to 100 square feet with specific postures, work modes, and expectations for quiet and privacy supported by a carefully chosen range of Steelcase and Coalesse furniture, materials and technology to create not just spaces that are physically quiet, but that offer an atmosphere where introverts can work their best. Every space is designed with V.I.A. walls which provide superior acoustic performance and combined with sound masking to ensure these spaces are free from audible interruptions. This Quiet Space provides a warm and receptive destination that gives workers permission to be alone and be themselves. This space is free from the gaze and interruption of others, encouraging vitality throughout a day by lounging, working or even closing your eyes for a few moments. 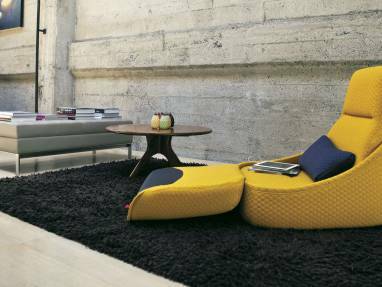 Lagunitas by Coalesse, provides comfortable and familiar seating, much like a couch in a living room, except it offers power to support mobile devices. This Quiet Space provides a place free from visual distraction or interruption for deep focus, strategic thinking and getting into flow. Natural materials like wood and wool create a calming state of mind, providing a place for focus, free from physical and cognitive distraction. The integrated monitor in V.I.A. allows amplification of digital content. The Elective Elements desk is large enough to spread out content while bookshelves are full of tools to support strategic thinking. Users can control lighting in the space, and V.I.A. keeps noise distractions at bay. This Quiet Space provides a more active environment where individuals can escape and rejuvenate through activity and/or stretching. Stretching provides greater blood flow to the brain, keeping the mind fresh and ideas creative. Control of the space is in the hands of the user, allowing them to customize lighting, music, volume and digital content based on their mood, task or personality. V.I.A. offers dimmable lighting, and integrated speakers allow users to control the mood of the space. Hosu seating supports relaxed and informal postures. The integrated monitor can be used to share news from home or calming content to support the need to rejuvenate. The open floor space allows users the opportunity to stretch, meditate and reset. This Quiet Space provides an informal destination to connect, share and build trust before, during or after a meeting. 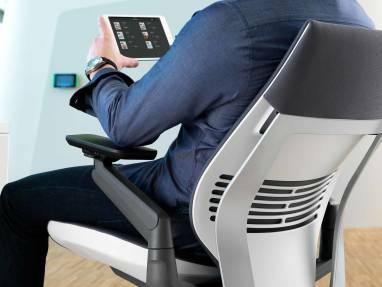 The lounge posture creates a relaxed, comfortable environment, while tools throughout the space support working and sharing of digital content. Lagunitas provides a comfortable and informal seating option. The divided sofa at 90 degrees offers specific places for people to sit perpendicular to one another, creating an individual sense of space and psychological safety. Power in Lagunitas supports mobile devices with the ability to share content on the integrated monitor. Lighting is dimmable. This Quiet Space offers introverts a trusted space where they can engage in deep conversation with a colleague, display and discuss content in confidence. Depending on the treatment on the V.I.A. glass, people would be able to see that someone is in the room, but content would be shielded from anyone who may be a passerby. Integrated media:scape allows workers to actively edit and build digital content while the whiteboard supports brainstorming. “These are spaces that don’t exist in corporate America, for the most part,” says Cain. “Some companies might have something approaching these spaces, but what I’ve seen since I started researching my book in 2006, is a ton of offices that are basically one gigantic room, with very little, if any, real privacy. The list of famous introverts includes great public speakers, innovators, and leaders such as Abraham Lincoln, Charles Darwin, Vincent Van Gogh, Rosa Parks, Eleanor Roosevelt, Albert Einstein, Frederic Chopin, and Audrey Hepburn. The Quiet Revolution, Susan Cain’s new mission-based company, was established in 2014 as a way to convert the unique awareness generated by her best-selling book “Quiet: The Power of Introverts in a World That Can’t Stop Talking” into action. With its mission to “Empower Introverts For The Benefit of Us All,” the Quiet Revolution launched its first initiatives in 2014 in the world of work. 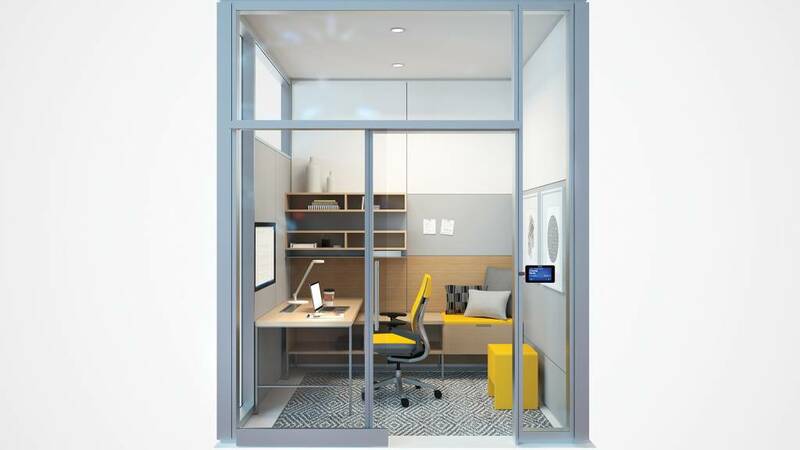 Through their landmark Quiet Spaces partnership, Susan and her Quiet Revolution are working alongside industry-leader Steelcase to help corporations reimagine how workspace can be used to harness the power of the introverted half of their workforce. And Quiet Revolution’s worker training organization, the Quiet Leadership Institute, is delivering outcomes-based training solutions to leading organizations that unlocks the value of introverted workers by making them aware of their unique strengths and empowering them to act. Through 2014 and 2015, the Quiet Revolution will continue to add offerings that further its mission, including for parents and teachers of introverted children, lifestyle offerings dedicated to helping people live a quietly beautiful life—in travel, home design, acoustics and wellness, for example—and more.